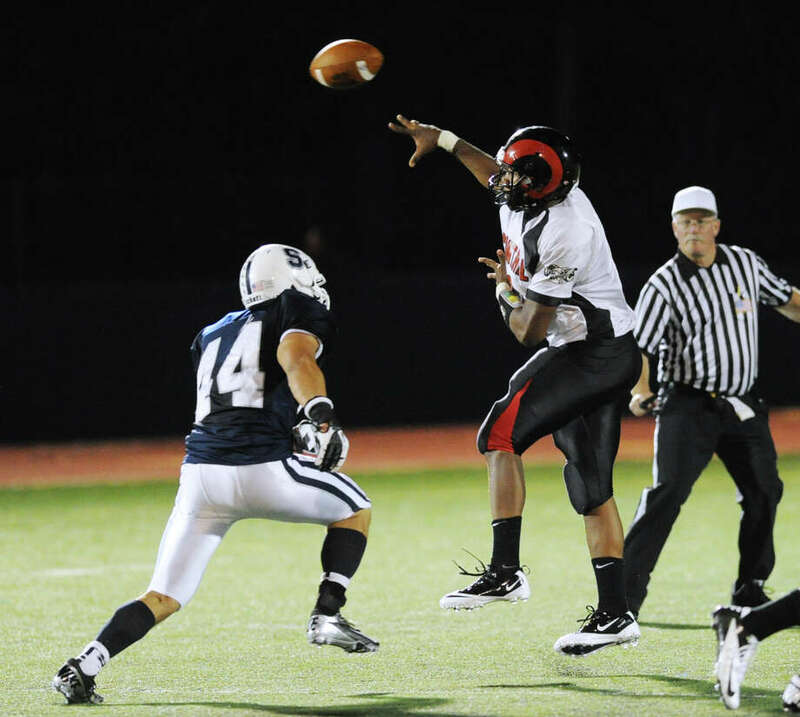 Bridgeport Central quarterback Xavier Hardison throws while being pressured by Pieter Hoets, left, # 44 of Staples, during Hhigh school football game between Staples High School and Bridgeport Central High School at Staples in Westport, Friday night, Sept. 21, 2012. Staples (7-0) vs Westhill (5-3), Thursday, 5 p.m.
Well this is a quick turnaround. Just three days ago, Staples left a dent in the end zone at Fairfield Warde's Tetreau-Davis Field--and for that matter, on the scoreboard--and cruised to its seventh straight win. The Wreckers' 49-20 dismantling of the Mustangs put them one step closer to a perfect regular season, and a win away from an FCIAC title game rematch. Barring a misstep on Thursday, Staples will find itself playing for its second conference title in as many years when it travels to face unbeaten Greenwich on Thanksgiving. At this point, considering all the lopsided scores we've had this year, a meeting between the two powers with that much at stake is certainly tantalizing. But first, the Wreckers have to take care of business against Westhill. The Vikings have been one of the conference's true surprises in what's been a drama-less season to date, as they're approaching their first winning season in 25 years. No matter how you choose to dissect the Vikings' season, breaking down the matchups from week to week, that's quite an accomplishment. The task for Staples is to put the game away early, lend the starters some rest, and close the door on all FCIAC and state playoff talk--at least for the time being. Right now, it seems as though we're just riding an endless cycle, crunching the angles of a Staples and Greenwich championship rematch. "It's never-ending," Staples head coach Marce Petroccio said last Saturday of the postseason talk concerning his team. "We're just going to be focused on what's in front of us, which is Westhill, and then get ready for whoever the next opponent is." In case you were wondering, you won't catch the Wreckers looking too far down the line. "We're trying to keep focused and we're trying to go 1-0 each week," senior running back Joey Zelkowitz said last Saturday, after rushing for 71 yards and a pair of touchdowns. Westhill's offense kicked into high gear last Saturday and took apart Wilton 41-28, as running back Davell Cotterell rumbled for 338 yards rushing and five touchdowns. It's hard to find a better single-game performance in the FCIAC, if not the state, this year, but don't expect Cotterell to go anywhere near those numbers on Thursday. As dominant as Staples is on offense, its defense isn't far behind. If anything, the defense showed against Warde--with a pair of touchdowns on interceptions--that it has some gamebreaking abilities as well. Expect the Wreckers to clear yet another hurdle with ease. Pick: Staples 56, Westhill 14. Weston (7-1) at Masuk (8-0), Thursday, 7 p.m.
Weston has been one of the finest stories this season for its ability to own the fourth quarter and churn out victory after victory. The Trojans are 7-1, in the heat of the Class M state playoff race, but now the road gets bumpy. On Thursday, the Trojans will take on a Masuk program that's entrenched itself as the class of the South-West Conference in recent seasons. The Panthers rode now-UConn quarterback Casey Cochran for years, but haven't missed a beat in the first go-round without him. The Panthers are still perfect, at 8-0, and are averaging just over 49 points per game on offense. They have one of the state's best playmakers in wide receiver Thomas Milone and all the talent in the world around him.